Investors going with health-care products maker Perrigo (NYSE:PRGO) will receive a quarterly cash dividend of $0.09 per share on June 18 to shareholders of record at the close of business on May 31 for the fiscal third quarter of 2013. That rate is the same it's paid in the current fiscal year, prior to which it had been paying $0.08 per share, or 12.5% less. 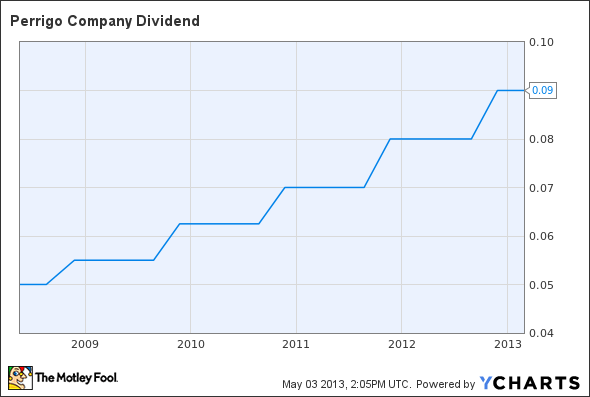 Perrigo has raised its dividend each year for the past decade. The new dividend annualizes to $0.36 per share, and yields 0.3% at the closing price of Perrigo's stock on May 2.